RASUWA, Jan 18: Dry landslides following the devastating earthquakes of 2015 had swept away several houses and schools in Rasuwa. Even after so many months, those schools have not been reconstructed and this has badly affected the education of the students in the district. 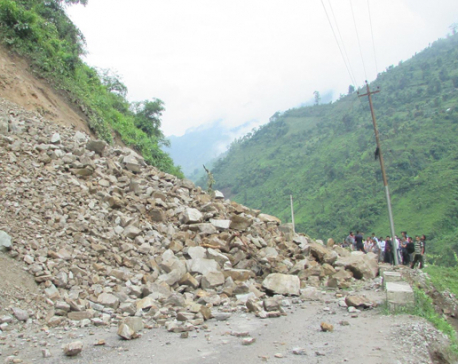 As many as seven schools of Uttargaya Rural Municipality, Kalika Rural Municipality and Gosainkunda Rural Municipality were displaced by earthquake-induced landslides. As per the details provided by the District Education Office (DEO), Rasuwa, the schools displaced by the landslides include Karumrayang Lower Secondary School, Dandagaun; Nepal Rastriya Primary School, Langtang; Ananta Smriti Primary School, Ramche; Bhumidevi Primary School, Uttargaya; Kalika Primary School, Haku; Tiru Primary School, Tiru and Bal Udaya Primary School, Haku. Though the locals displaced by the earthquakes and landslides have already returned back to their homes, students have not been able to continue their education properly. More than 32 months after the major quake, the government is hardly bothered about the degrading standard of education in the district. As there is no other school in Langtang besides Nepal Rastriya Primary School, students here have been deprived of education. According to Subba Lama, chairperson of Gaosainkunda Rural Municipality-4, delay in reconstruction of schools has put the future of students at risk. While many locals have already returned back to their houses, some have not been able to do so considering the education of their children. District Education Officer Homnath Neupane informed that efforts have been made to reconstruct the schools displaced by the quake. "As the central government has empowered the local governments, we have been holding repeated discussions with the elected representatives of the local bodies for the reconstruction of schools," said Education Officer Neupane. Currently, there are 89 schools in the district.